Family Plantaginaceae, genus Plantago L.
Perennial weed with main root. Main root short or lengthened, with numerous lateral roots. Stem with longitudinal furrows, to 50 cm in height. 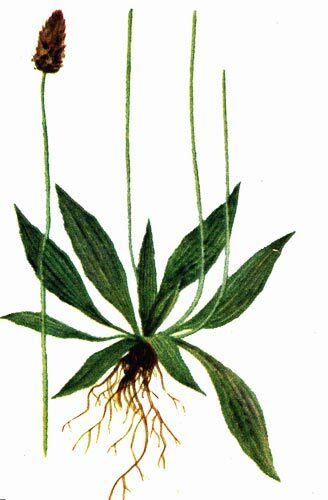 Rosette leaves lanceolate or lanceolate-elliptic, pointed, integral or slightly dentate along margins, with cuneate base, with 3-7 veins, pubescent or glabrous from below along veins, located on more or less long (2-13 cm) petioles; the latter slightly pubescent at base. Flower stems faceted-costate, several times longer than leaves, pubescent. Inflorescence is a false ear, oblong-ovoid or short-cylindrical, almost spherical, 0.5-5 cm in length. Bracts ovoid, almost scarious, pointed, with well expressed carina. Lobes of calyx scarious, with brown or green dorsal carina; two fore lobes coalesced in one, emarginated at top; the other two lobes navicular, with dorsal villosity. Corolla light-brown, with horizontal or downward directed lobes. Anthers light yellow. Ovary two-celled, with one seed-bud in each cell. Boll elongate-oval, with two seeds. Seeds fine, brown, smooth, shining, semicircular on one side, grooved on another side. Blossoming and fructifying since May till September. Weight of 1 seed is 0.3 mg. Seeds keep in ground geminating capacity more than 11 years. One plant gives about 5340 seeds distributed mostly by animals. Seeds have high and rapid geminating capacity at temperature 15-25°C. Almost all Europe, the Caucasus, Western and Eastern Siberia, the Far East, Central Asia, northern Africa, Asia Minor, Iran, Afghanistan, western Himalayas, northwest China; adventive in Northern America and Australia. The weed grows on rather damp soils, along roads and irrigation ditches, on meadows, forest glades, in garbage places, kitchen gardens, gardens, mainly on carbonate and sandy soils. The weed litters crops of perennial grasses, especially irrigated perennial lucerne where it is a specialized weed; the species is a weed in clover crops as its seeds are difficultly separated from seeds of the culture at cleaning; it litters winter grain, going in crop rotation after clover, being also met in crops of tilled cultures. Control measures are stubbling by disk and plowshare skim plows to depth of 8-10 cm with the subsequent harrowing and packing of soil; deep autumn plowing by a plow with skim-coulter, half-fallow treatment of winter tillage, cleaning of sowing material from seeds of the weed, mowing of fodder lucerne till the plantain semination, maintenance of crop rotation; application of herbicides, if necessary. Nikitin, V.V. 1957. Weed vegetation of Turkmenia. Ashkhabad: AN TurkmSSR, 581 p. (in Russian). Nikitin, V.V. 1983. Weeds in the flora of the USSR. Leningrad: Nauka. 454 p. (in Russian). Shishkin, B.K., ed. 1965. Flora of the Leningrad Region. V. 4. Leningrad: LGU. 356 p. (in Russian). Simonov, I. 1969. Weeds and their control. Sverdlovsk: Sredne-Ural`skoe Publishing House. 132 p. (in Russian).